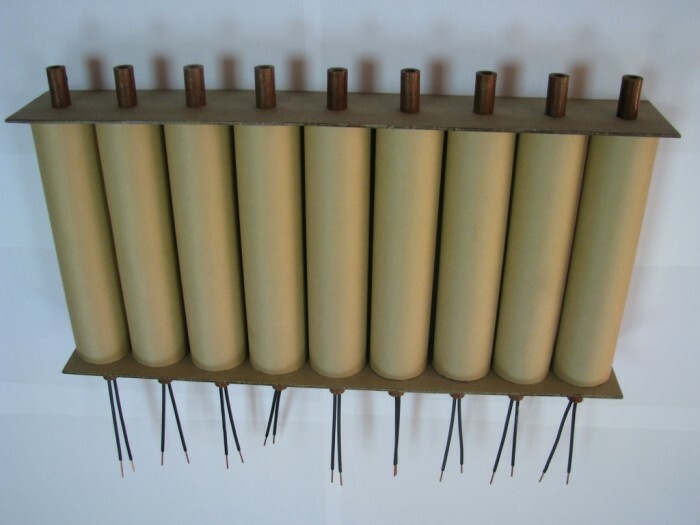 At oil transformer coils made by paper insulation, the present of water in paper lead to insulation demotion and electric faults. In the vat of transformers, at ambient temperature, the water migrates from oil in the isolation paper. The water in paper is distributed uniformly. At present times, for extracting the water from the isolate paper of coils conductors, with transformers in function, most used method consist in heating oil at 60-70 Celsius degrees, and after, when the water migrate from paper in oil, treating the oil to extract the water online in special installation outside the transformers. But, heating the oil at 60-70 Celsius degrees means to heat also the conductor's isolation with the possibility to deteriorate the paper qualities. One solution for this problem could be to set up an absorbent water battery in the vat of transformers. 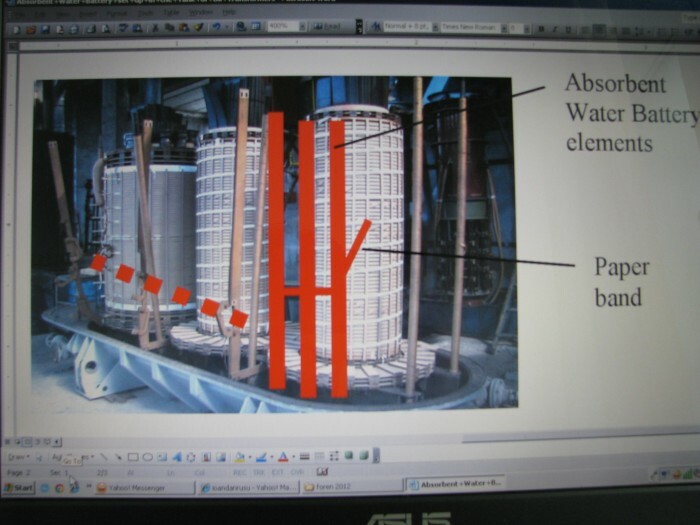 So, the water inside the transformer will migrate in papers insulation coils but also in the absorbent water battery. If the quantity of coils paper is equal with the quantity on paper of battery, only 1/2 of water will migrate in paper insulation coils. For a transformer 110/20kV - 25 MVA, it is necessary for insulation coils about 500 Kg of paper. So, for the Absorbant Water Battery it is neccesary minimum the same quantity of 500 Kg paper. All cost for an Absorbant Water Battery in weigh of 500 Kg it is about 5000 $. All cost for a new transformer 110/20kV - 25 MVA on market it is about 500 000 $. So, the cost for an Absorbant Water Battery it is about 1 % of the total transformer costs. The Absorbant Water Battery could be set up in a special box outside and connect by piplines at the tank of transformer. ( Fig. 10). For oil circulation, it is necessary a pump for oil This supplimentary oil circulation, could be an advantage for cool the oil also in the box of battery. It is also necessary more space nearby the transformer for battery. In this techological solution, it is the possibility to change the Absorbant Water Battery with a new battery by stop the oil pump and isolate the battery box. Page created at 2019-04-24 18:21:00, Patent Auction Time.